The Arctic Report Card is out and it isn’t quite encouraging. Researchers say that the Arctic continues to warm up at an "astonishing" rate. 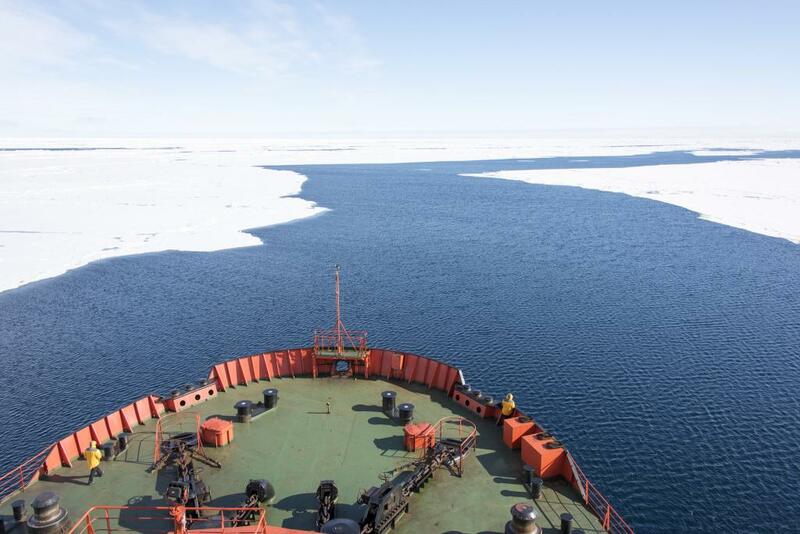 The report, which was prepared considering a range of environmental observations throughout the Arctic, highlights the changes that continue to occur in physical and biological components of the Arctic environment. "The Arctic as a whole is warming at least twice as fast as the rest of the planet," says Jeremy Mathis, climate scientist at the National Oceanic and Atmospheric Administration (NOAA). He is also one of the authors of the report card. According to polar scientist Marco Tedesco, warmer winters have created a new "precondition" for a higher rate of melting in the spring, when the sun first rises after the dark Arctic winter. The region normally remains cool because snow and ice reflect a lot of sunlight back into space. However, warmer temperatures are replacing ice with water, with the latter absorbing more of the sun's heat, thus making the Arctic warm up faster. The report card revealed an increasing melting trend in the Greenland Ice Sheet in 2016, with enhanced melting happening in the southwest and northeast regions. Going by the report, the onset of surface melt ranked second (after only 2012) over the 37-year period of satellite record (1979 - 2016). The duration of the melting season was 30-40 days longer than usual in the northeast and 15-20 days longer along the west coast, when compared to the 1981-2010 average. A similar report, which was released in September 2016, had shown that the total number of ice-covered days declined by seven to 19 days per decade in 35 years. 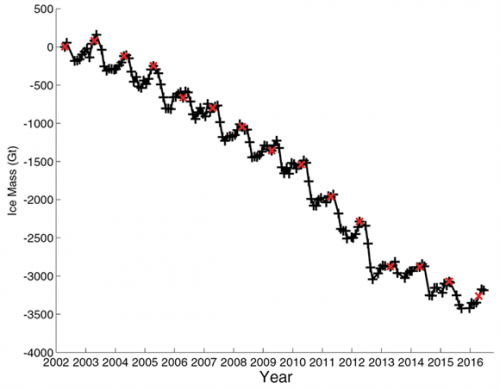 Estimates made by Gravity Recovery And Climate Experiment (GRACE) satellite indicate that between April 2015 and April 2016, there was a net ice mass loss of 191 giga-tonnes (Gt). In 2016, the melt season started as early as April 10, with melt extent in April reaching values generally recorded in early June. Periods of extensive melt were also recorded in mid-May and in June. According to the report card, the melt extent from June through August 2016 was above the 1981-2010 average on 66 per cent of days. Warming of the Arctic is causing permafrost (normally frozen ground) to melt. As the permafrost is carbon-rich, when it melts, it becomes a source of greenhouse gases—carbon dioxide (CO2) and methane. The report revealed that northern permafrost zone soils contain 1330-1580 billion tonnes organic carbon, twice the quantity currently present in the atmosphere. Warming conditions lead to microbial conversion of permafrost carbon into greenhouse gases that are released to the atmosphere, thus accelerating climate change. The average surface air temperature for the year ending September 2016 has been the highest since 1900. Moreover, record for monthly highs was set for January, February, October and November 2016. Minimum sea ice extent at the end of summer of 2016 was the second lowest since 1979. Snow cover extent during spring in the North American Arctic was the lowest since the US started making satellite record in 1967. In 2016, earlier onset of spring melting was observed. This was the second time since 1979 that such an instance was observed. Certain areas of the Arctic shelves experience prolonged ocean acidification events in shallow bottom waters. Cooler water temperatures and unique process of formation and melting of sea ice make Arctic waters disproportionately sensitive to ocean acidification when compared to the rest of the global ocean.